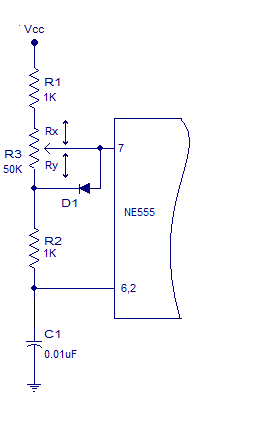 A simple and efficient PWM lamp dimmer using timer IC NE555 is discussed in this article. Yesterdays linear regulator based dimmers can only attain a maximum efficiency Â of 50% and are far inferior when compared to the PWM based dimmers which can hit well over 90% efficiency. Since less amount of power is wasted as heat, the switching elements of PWM dimmers require a smaller heat sink and this saves a lot of size and weight. In simple words, the most outstanding features of the PWM based lamp dimmers are high efficiency and low physical size. The circuit diagram of a 12V PWM lamp dimmer is shown below. What ever may be the position of Â POT3 knob, the total resistance across it remains the same (50K here). If anything decreases in the upper side (Rx) the same amount will be increased in the lower (Ry) and the same thing gets applied to the higher(Ton) and lower(Toff) time periods. The derivation shown below will help you to grasp the matter easily. From the above equation its is clear that the frequency depends only on the value of the components C1, R1, R2 Â and the over all value of R3 and it has nothing to do with the position of R3 knob. 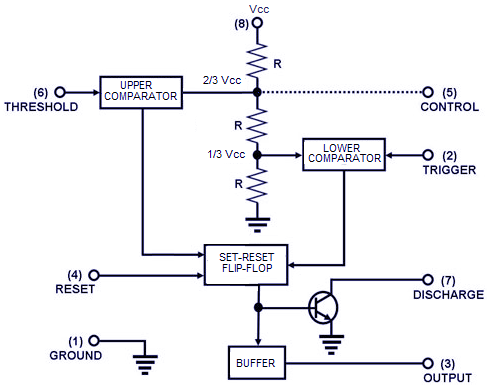 The output of the 555 can deliver 100mA and the first transistor is not needed. When the transistor is removed, the lamp will achieve much higher brightness. The Darlington arrangement is a DISASTER. can i use bc 547 instead of 2n2222 and sl 100 instead of bd139??? Can we use a 9 V DC battery instead of 12 V DC supply…and do we hav to use a regulator or is it automatic? Use regulated supply of 12 volt DC. if you use 9 volt regulated supply the bulb rating also should be reduced to 9 volt. please note that this circuit will be effective for incandescent lamps only. Nice circuit. I would like to once test this circuit in my home as it would be more useful to get experience for my project in the next month. Thanks for sharing this circuit. simple any electronic circuits send the mile . Thanks for the PWM circuit and as the explanation is very clear and simple. What is the ideal frequency to run a motor with a PWM circuit. sir, can i use 12v 20w bulb instead of the above mentioned lamp? Hi Shamanth BD 139 can only handle just 1amp current. hence replace it with a power transistor like 2N3055 or BD182 or replace both Q1 Q2 with a single power darlington transistor like TIP122 with a good heat sink. I’d like to use this on a 12v 50Watt spotlight. do I need to change any components. Please inform me whether this circuit can be modified to control the 230 volts ac soldering Iron (ceramic heater) using Triac and if so what are the modification required. Yes you can modify this circuit for controlling 230V AC devices. 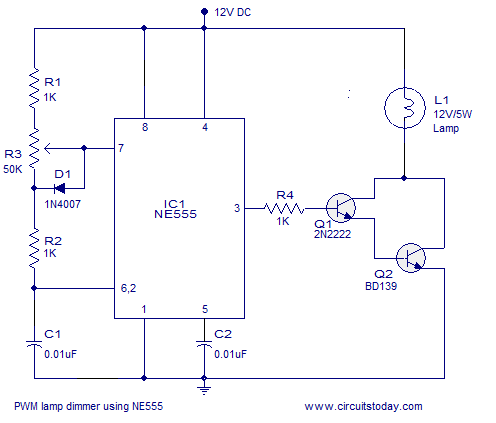 But there are simple alternatives like this http://www.circuitstoday.com/modified-lamp-dimmer-circuit .